The Spirit International Amateur Golf Championship has been around since 2001 but many people that love golf don’t know about it. The video below is a nice overview of the championship. I learned about it because I follow Paige MacKenzie on Twitter and Paige is the captain of the 2013 United States team. Paige is also a former Spirit International competitor. I watched the last hour of coverage on Thursday and Friday online and really enjoyed it. I wish I could have seen more but it is impossible to watch this type of event during a work week. You can watch it Saturday (November 2, 2013) via the live webcast at the Spirit International Website. There are only four players for each country (20 Countries represented by 2 men and 2 women). It may be a small field but the golfers are some of the best young players in the world and it is a nice preview of what we can expect to see in the coming years on the professional tours. Past Spirit International competitors include US stars like Brandt Snedeker and Paula Creamer; as well as international stars such as Jason Day, Charl Schwatzel, Lorena Ochoa, and Ya-Ni Tseng. As they say, the list goes on and on. International Team- combined best ball of the men’s team and women’s team. Men’s Individual- Most holes under par. Women’s Individual- Most holes under par. So you can cheer for your favorite country, men’s team, women’s team, and individuals. I want the United States and Canada to do well because I have lived in the United States most of my life and feel an allegiance to the US; but I was born in Canada and I have a soft spot for athletes from Canada. I hope that Brooke Henderson (a young Canadian golfer whose career I follow) does well. I am happy to report that as of the end of the second round Brooke is in first place for the Women’s Individual competition. The United States is leading the overall competition. Check out the Leaderboard to see the other country standings. And if you can’t watch the live webcast then the next best thing is following the championship updates on twitter @thespiritgolf. UPDATE (November 3 2013) – USA wins overall and Brooke Henderson wins Women’s Championship. See all results at the Spirit Website. The Golf Channel Morning Drive Show has a daily poll question and one question was on a topic I have written about often — young golfers. The question was posed because a 14-year-old amateur golfer from China, Guan Tianlang, won the Asia-Pacific Amateur Championship and a spot in the 2013 Masters. As you can see from my response to Lauren Thompson I did not select any of the four options. Yes, I think all (coaching, equipment, global exposure and technology) are important factors but that does not speak to the underlying support system that allows kids to pursue a sport with such intensity at such young ages. The only way a child can achieve such great success at such a young age is because the parents support it. There will always be the debate as to whether or not the child truly “wanted” to “live and breathe” golf or if the parents really wanted it for the child. But either way, the steps the parents must take to create the opportunity is the basis for it all. Tiger Woods is the most famous child prodigy that ever played the game. Yes, Tiger has proven his place in history as one of the best golfers ever. However, I truly believe Earl Woods, Tiger’s father, was the mastermind behind the Tiger brand that exists today. After all, Earl Woods not only taught his son golf at a young age but also was savvy enough to get his son “exposure” at a very young age. If you have not seen it, below is the video of 2-year-old Tiger on the Mike Douglas show. After Tiger, the next young phenom to come along was in women’s golf – Michelle Wie. At the age of eleven Wei was the youngest player to qualify for a USGA amateur championship. Wie’s career has not been as stellar as predicted; although she has reaped the financial benefit and fame sponsors like Nike deliver. In recent years Wie’s poor play has been blamed on her focus on college but now that she is out of school she is still struggling to find her game. Only time will tell if Wie will become a truly great golfer. If she does not become a champion golfer then Wei’s rise and fall may become a cautionary tale of burnout or peaking too soon. Andy Zhang, a 14-year-old amateur golfer (also Chinese but living in Florida) made history as the youngest player in the US Open. Lydia Ko, a 15-year-old from New Zealand (originally from South Korea) made history winning the Canadian Open. Ko is the youngest player to win a LPGA event. Beau Hossler, a 17-year-old Californian, became a sensation at the 2012 US Open when he took the lead (over Tiger) for a short period of time. Lexi Thompson won the Navistar LPGA Classic in 2011 at age 16 which triggered Mike Whan, LPGA Commissioner, to waive the 18-year-old age requirement for turning pro and gave Thompson (age 17) her PGA tour card for 2012. Guan Tianlang, 14-year-old amateur golfer from China, made history as the youngest winner of the Asia-Pacific Amateur Championship and will make history in 2013 as the youngest golfer to ever play in the Masters. So is this a good thing for the sport or not? Some will say “yes” because it will bring a younger audience to the game and hopefully grow the game for the future. Some will say “no” for reasons such as it is not good for the child (i.e. the pressure, the travel, the risk of injuries at a young age). Whatever your opinion there is one thing that is hard to argue and that is “the cat — or should I say, Tiger — is out of the bag” and there is no turning back now. Lydia Ko makes history, again. Is Ko an “amateur” in name only? It was amazing to watch Lydia Ko win the CN Canadian Women’s Open. However, what was really surprising was that Ko was the lead story on Golf Channel’s wrap-up show, Golf Central. It is rare that a ladies event overshadows a PGA event, but Lydia Ko’s win overshadowed Nick Watney’s win at the Barclays. I wrote about Lydia winning the US Women’s Amateur just a few weeks ago. Ko is an amazing golfer; but what is really surprising is her demeanor on the golf course and during her press conferences. She has a lovely personality. She smiles all the time (and said in the press conference she tries to smile even when she makes a bad shot). She is quick to acknowledge all the people supporting her golf career and seems to recognize that her amateur schedule is like a job. She stated in various interviews that she has missed many months of school with all the world traveling she is doing for golf. They will also have funding assistance to ensure their attendance at national events throughout their term in the Academy. For the very best of the Academy there will be a contestable ‘International Tournament Campaign Fund’ to help assist them create and manage their own international tournament campaigns. (Note: the website even lists specific tournaments in Asia, UK/Europe, Canada, and the USA). Wow, given the “funding” support it is hard to call Lydia Ko an Amateur. Clearly, the financial support to travel all over the world to compete against the worlds best golfers is a luxury most American amateurs would love. Actually, I think a lot of “journeymen” players and “rookies” on the professional tours would love that kind of financial support. The support Lydia Ko receives does not take away from her talent or her win. She is still a 15-year-old playing an individual sport and it is her talent and mental fortitude that has allowed her to win at the highest level of golf. However, the support Ko receives “outside the ropes” is not something all amateurs get. Judy Rankin, Golf Hall of Fame member and commentator for LPGA golf events, often comments during her on-air TV analysis that international amateurs (supported by golf federations) have an advantage over American amateurs. The lack of international travel and opportunity to play against the best in the world is a big issue for the development of American Amateurs. Is Lydia Ko like other Amateurs at all? One way Lydia Ko is a normal amateur is that she does not have the pressure a professional has to win. Professionals feel pressure because golf is how they make their living. 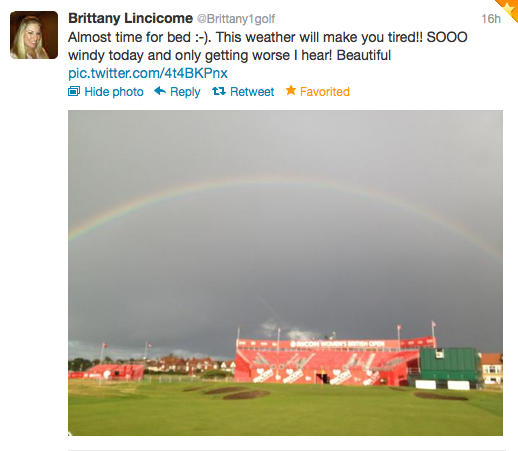 Maybe a good example is Lexi Thompson. In 2007, at age 12, Thompson was the youngest golfer to qualify for the US Women’s Open and turned pro at 15 but did not have her LPGA card. Thompson was entering LPGA tournaments on sponsor exemptions. Thompson made history when she won her first LPGA event (the Navistar LPGA Classic) at 16 years, 7 months and 8 days old. Given her win, the LPGA waived the age minimum/restriction and granted Lexi Thompson her card. But as a professional, Thompson has struggled this year and missed the cut at the CN Canadian Women’s Open. The other past “amateur phenom” to miss the cut this week — Michelle Wie. Is Lydia Ko an amateur in name only? I say yes because she plays like a professional, she travels and competes worldwide like a professional, and she has “financial support” that mirrors the economic benefit to cover travel costs that a sponsor deal might cover (without the official sponsor). Who knows when Lydia Ko will become a professional. Until that time, I’m sure Lydia Ko will continue to amaze the golf viewing public with her amazing talent. The next big question is when she does turn professional, will she continue her phenomenal rise? Will Ko be the next Annika or Tiger?. Only time will tell. One thing is for sure — the golf world will be watching.